You were in a hurry and didn't take time to sort the laundry before tossing it in the washer. Now everything has blue streaks. Why? When you washed those jeans and light colored tees together, the new blue jeans released dye and now your yellow T-shirt is streaked with blue and looks kinda green. You may be able to reverse the damage this time. But, can you ever set the color and stop the bleeding of dye from clothes? Learn what works and what doesn't. If you suspect that brightly colored clothes are going to bleed, should you try to "set the color"? Some people add salt to a load of clothes to set the color, while some swear by the idea that adding distilled white vinegar to the wash or rinse water will set the dye. Unfortunately, neither method will work reliably to prevent dye bleeding from clothes or fabrics that have already been commercially dyed. Don't waste your time or resources. There is some science and history to the salt and vinegar stories. When cotton yarn or fabrics are dyed, salt is added to the dye bath as a mordant to help the fibers absorb the dye. For wool or nylon, the acid in vinegar acts as a mordant in the dye bath to help the fibers absorb dye. But neither is a dye fixative for already dyed fabric or fibers. So, what can be done? There are commercial dye fixatives that can be purchased for home use. Brand names include Retayne and Rit Dye Fixative. However, these are intended for use by artists and small companies that dye fabrics and understand the type of dye they are using. These should be used when dyeing fabrics at home with a commercial dye like Rit or when dyeing fabrics and fibers with natural dyes you have created from plants. Dye fixatives are cationic which means that they have a positive charge. The positive charge allows the fixative to cling to negatively charged dyes, such as direct dyes and acid dyes. They cannot stick to basic dyes, which have a positive charge and have no benefit for creating colorfastness. 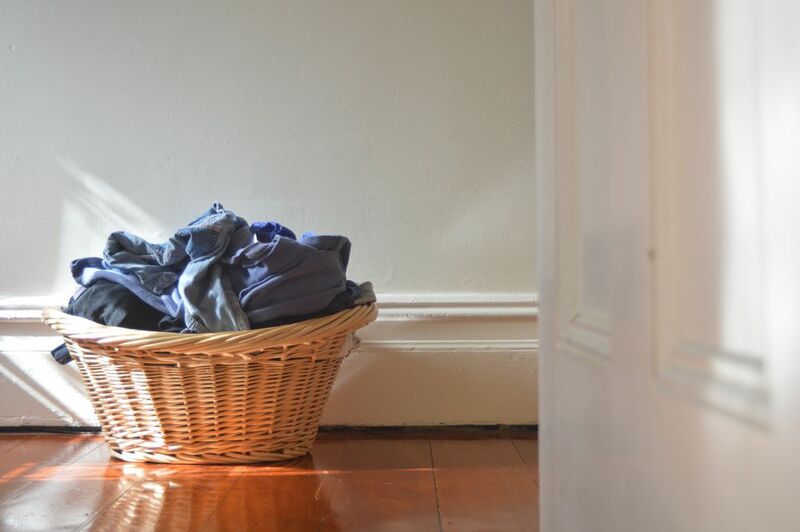 Some regular laundry tips that you may already practice will help guard against color bleeding. Test any questionable garment to be sure it is colorfast before washing with other clothes. Hand wash clothes separately that have bled color previously. For clothes that may bleed, like blue jeans, wash them in a load with similarly colored clothing. Do not rely on detergents and color catcher cloths that promise to trap dye. They are not reliable and you may still end up with pink underwear. Use cold water when washing and rinsing to help colors last longer. Sort your clothing carefully and correctly before loading the clothes washer. Why Do Some Fabrics Bleed Dye? Not all fabrics behave well after they are manufactured and can lose dye in three ways. Crocking occurs when color is transferred as the fabric rubs against another surface. If you have ever seen blue streaks on upholstery after wearing new blue jeans, you've witnessed crocking. It occurs because the dye was not properly adhered to the fabric. Color bleeding happens with the fabric gets wet and dye leaches out into the water. This is what happens when a red sock invades your load of white underwear leaving them pink. Color fading is when the fabric loses dye due to bleeding, crocking, exposure to bleaching products, or intense ultraviolet rays (sunlight). All of this color loss happens due to how the fabric was manufactured or because of incorrect handling by consumers. Excessive exposure to hot water during washing can cause the mordant to be washed out of the fabric. If the mordant is washed out, it will no longer hold the dye to the fibers. Use the lowest water temperature possible to wash colored clothes. Control rough treatment of the fabric by not overcrowding the washer, skipping harsh detergents, and avoid washing in hard water that can cause micro-breakages in the fibers and lead to the release of dye. Avoid overuse of bleaching products, too much exposure to the sun, and excessive heat that can cause fabrics to fade and release the dye. Before wearing jeans or any garment that you suspect might shed color due to crocking (test by rubbing briskly with a clean white cloth), wash them separately to remove loose dyes. Will the Bleeding Clothes Ever Stop Fading? Maybe. Some clothes do stop releasing dye after several washes. But be careful; don't trust them completely. Higher water temperatures may cause the release of dye even after a few years. Never wash an unstable dyed garment with any other clothes you care about.